WASHINGTON, DC – Cosmopolitan Magazine, an international fashion magazine for women, featured Lean Together: An Agenda for Smarter Government, Stronger Communities, and More Opportunity for Women, a publication of the Independent Women’s Forum (IWF), among its top 20 political books every woman should read. Released in an article “20 Political Books Every Woman Should Read,” the must-read list—which included books written by Senator Kirsten Gillibrand, Melissa Harris-Perry, Lilly Ledbetter, and Peggy Noonan--was compiled by asking political consultants on both sides of the aisle for a list of “great political books” to read in the lead-up to the presidential election. 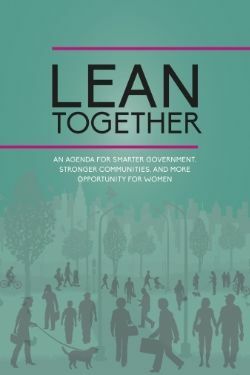 Lean Together, published September 1, 2014, consists of 12 chapters, all written by female authors. It lays out a positive agenda of policy initiatives to help create more opportunity and thriving American communities. IWF recognizes that for too long progressives in Washington have put forth a picture of America in which government is the solution to every problem, where a nanny state dictates our children’s lunches, provides one-size-fits-all health care, controls our education, and even determines what kinds of light bulbs we use. In Lean Together, IWF offers an alternative vision of empowering individuals and strengthening communities to reawaken the American dream. For more information visit Lean-Together.com.